MapleStory M is a new mobile game created by the makers of the popular MapleStory original. It’s available now for both iOS and Android devices. MapleStory M will be an all-new mobile adventure based on the original side-scrolling 2D franchise while MapleStory 2 on the PC will take the franchise into 3D graphics for the first time. VentureBeat is one of the largest tech blogs worldwide. They posted an extensive MapleStory M review on their website. You can check that one out here. They spoke with Jungsoo Lee, the president of the company Nexon, that created MapleStory for Mobile. We played the game since beta and we cannot agree more with Jungsoo Lee. In MapleStory M, players will return to the Maple World with all the familiar characters and monsters. 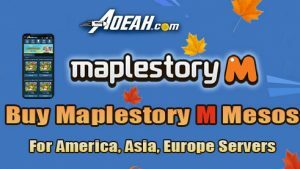 Maplers can play as five unique MapleStory Characters hunting for loot in Daily Dungeons, level up, discover new locations, and play with friends in epic boss battles. One of the features we like the most. You can play with up to 10 (ingame) friends to battle agains bosses. They range from weak to very very very strong. We haven’t got them all, but we are close to beating most of them.